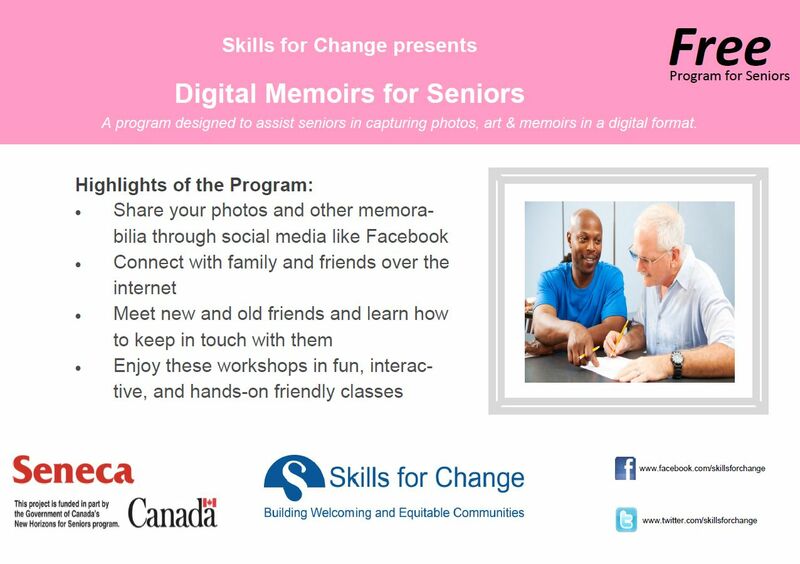 A FREE program designed to assist seniors in capturing photos, art & memoirs in a digital format. This program has been designed to be a fun, interactive, hands-on opportunity to connect with family, friends, peers and community in a new and meaningful way. The program is being facilitated by Skills for Change in partnership with Seneca College. The sessions are starting on Nov 07, 2015. Call them if you’re interested! Future sessions are also available and classes are being held at 791 St. Clair Ave. W.
Digital Memoirs for Seniors program is a great learning and engaging opportunity for seniors, where instructors will show senior participants how to transform pictures, writings and other memorabilia into digital format, so these memories can be easily saved and shared over the Internet using easy to use social media platforms such as Facebook etc. Know how to use a computer mouse or have prior experience typing on computer or typewriter, general knowledge of what a computer is. Participants will not be expected to work on their photos outside of class. If a potential participant is lacking some or all of the above competencies, they are still welcome to participate but are strongly encouraged to bring a friend or family member who can assist them. Skills for Change is a not for profit organization with over 32 years of dedicated service to immigrants, youth, women and seniors, with programs ranging from settlement to employment, mentoring to skills training, and is provided at 8 different locations in the GTA including York region. Their goal is to provide learning and training opportunities for immigrants and refugees and to create Welcoming and Equitable Communities for the benefit of immigrants and citizens alike. ← Did you know Seniors can Volunteer @WTSSorg?